In the words of Will Smith himself, “welcome to Miami!” From iconic South Beach with rollerbladers wearing next to nothing to Ocean Drive’s art deco, shopping and nightlife vibe, Miami has more than enough to keep anyone occupied. If we’re talking about one of the most famous, stylish, chic, and sunny cities in the world, how can we not mention Miami? 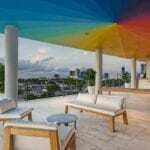 Bursting with sunshine, dripping with celebrities, and THE place to “see and be seen” in South Florida, Miami is a hotbed of style. This extends to the architecture, as well, including the famous MiMo style you’ll see at every corner. MiMo is short for “Miami Modern,” and it’s Art Deco-feeling, post-war regional architecture that you can find all over Miami. 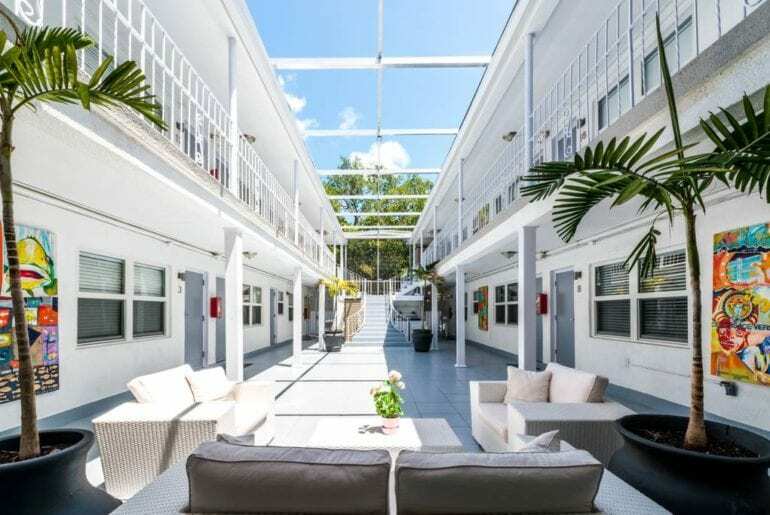 Some of the best examples are these stunning Miami MiMo Airbnbs. 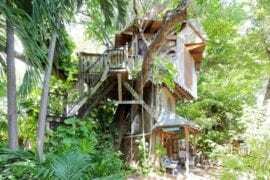 You’ll also find many stylish and super-luxurious places to stay, so let’s check out eight gorgeous Airbnbs for fans of Miami’s famous MiMo architecture style. 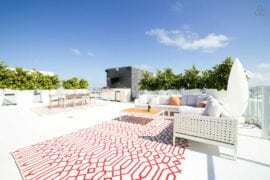 The Miami Modern style is alive and well inside this ultra-chic high-rise apartment. Tropical vibes meet modern luxury on the 48th floor, with sweeping views of Vice City and beyond. How could you pass up the chance to watch the sun rise and set from this amazing location? 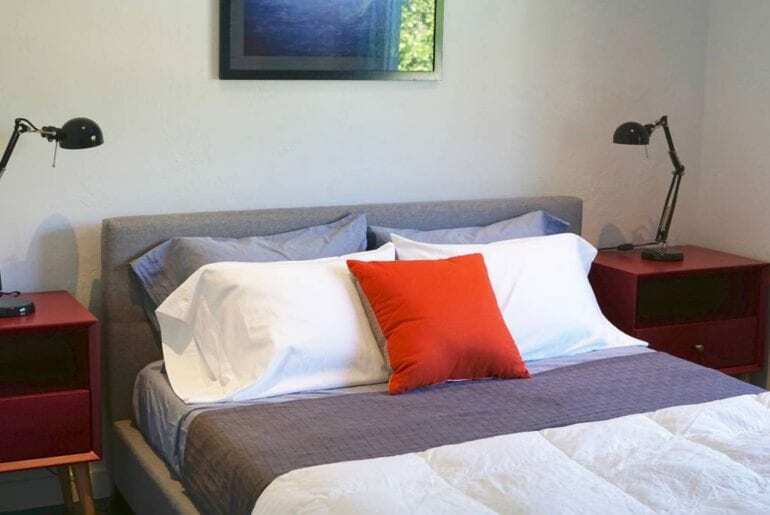 With room for four guests and a fabulous pool deck and heated jacuzzi, this spacious, modern style rental could be yours from just $141 a night. 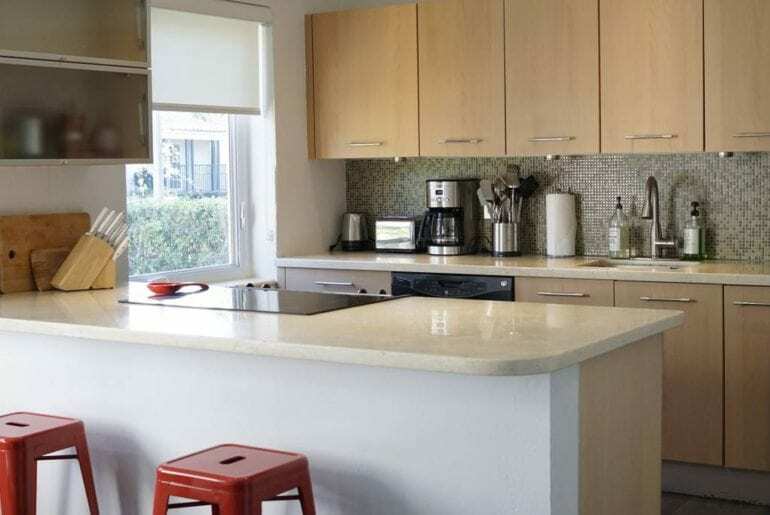 Ideal for groups of friends or even couples on a romantic Miami break, it’s easy to embrace the Miami Modern style in this dreamy Airbnb. 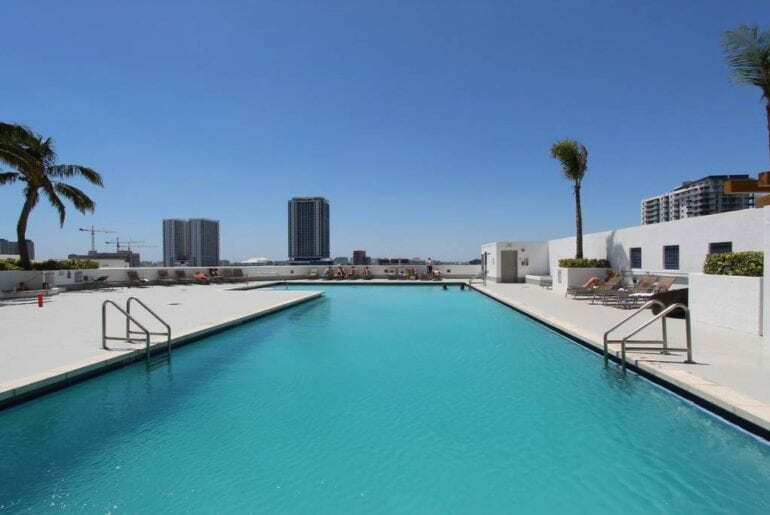 This stylish, Miami Modern high-rise building has a stellar location in the heart of downtown. Take in the skyline views from your own private balcony and feel like an elite jet setter! 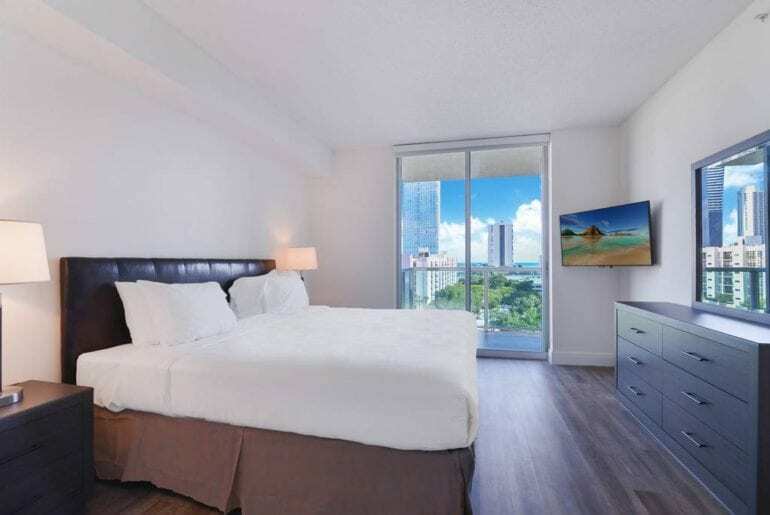 This spacious studio apartment with Downtown views is a great example of cool Miami MiMo Airbnbs. 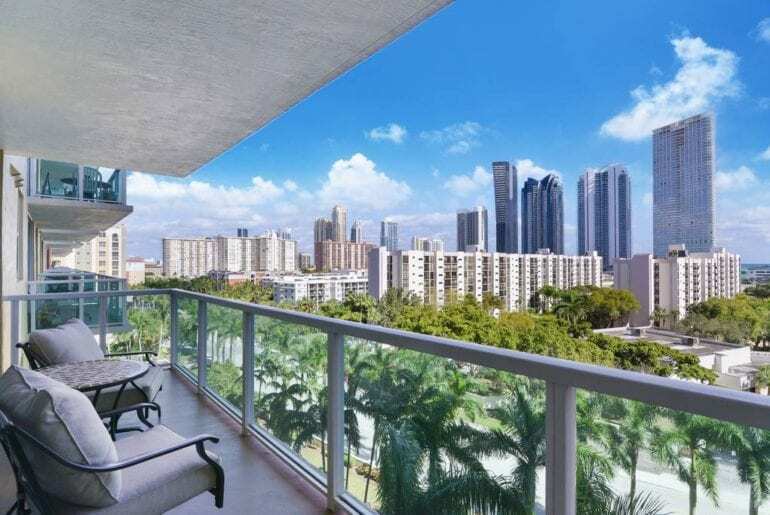 Step out onto the private balcony and let your jaw drop as you take in the downtown Miami skyline. 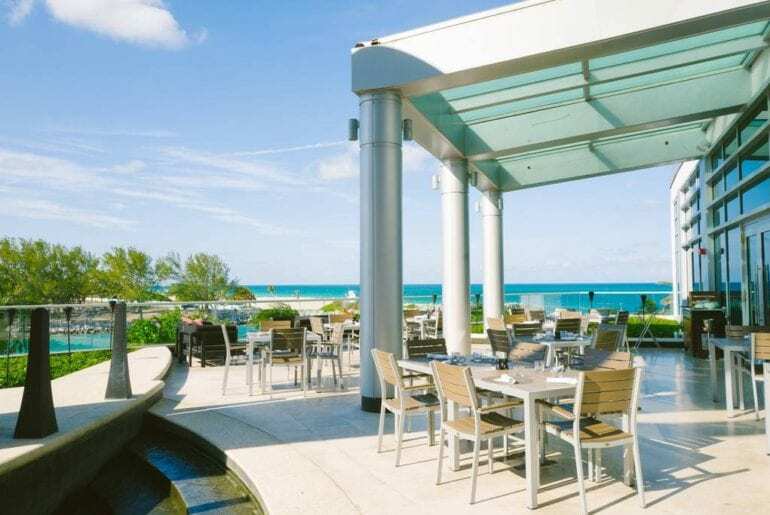 With cozy cafe-style seating, the balcony space is ideal for chilling with a glass of wine before heading out to hit the Miami nightlife. 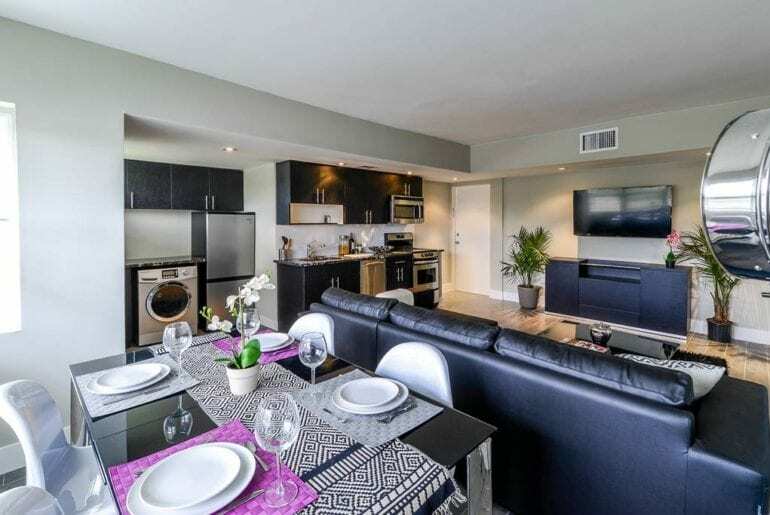 Best of all, at just $99 per night, this modern Miami high-rise apartment gives you luxury and style in abundance, without breaking the bank! The Miami Modern architecture style hit South Beach in the 1920s and 30s with a major building boom. This renovated complex is a great example of stylish, new Miami MiMo Airbnbs that trendy travelers are loving right now. 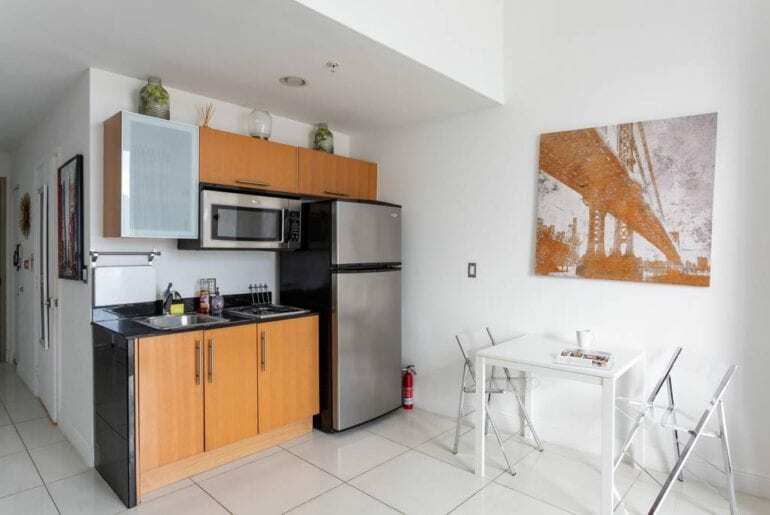 Available from $100 a night, this bright and modern one-bedroom MiMo apartment is a great find. 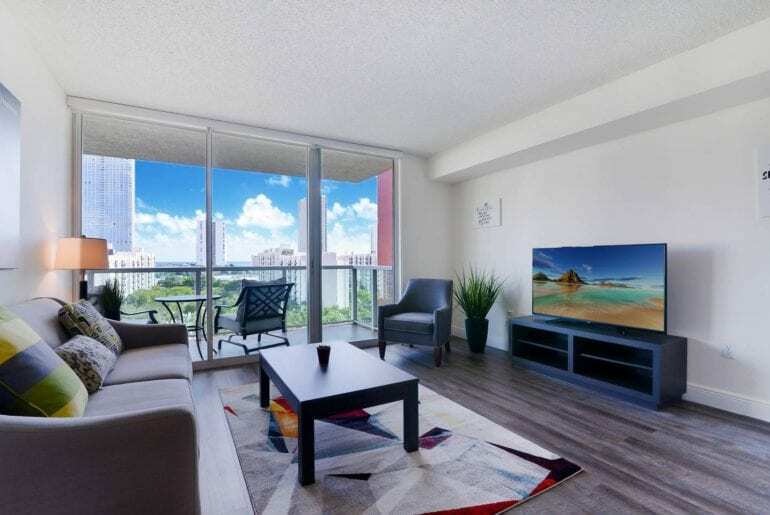 Just a short drive from Publix supermarket, Miami Beach, and nightlife in the Design District, this great apartment is the kind of place that makes you feel right at home. 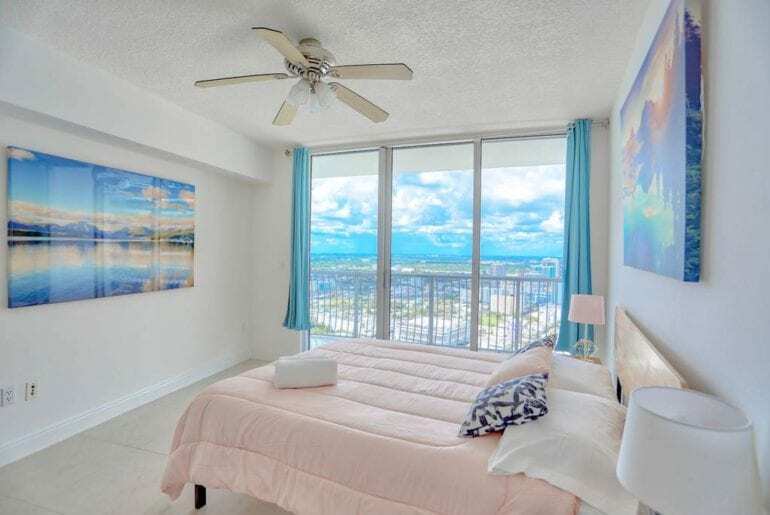 With a sunny bedroom and open-concept living/dining/kitchen space, the apartment is ideal for a couple or a solo traveler looking to stay in Miami for a while! 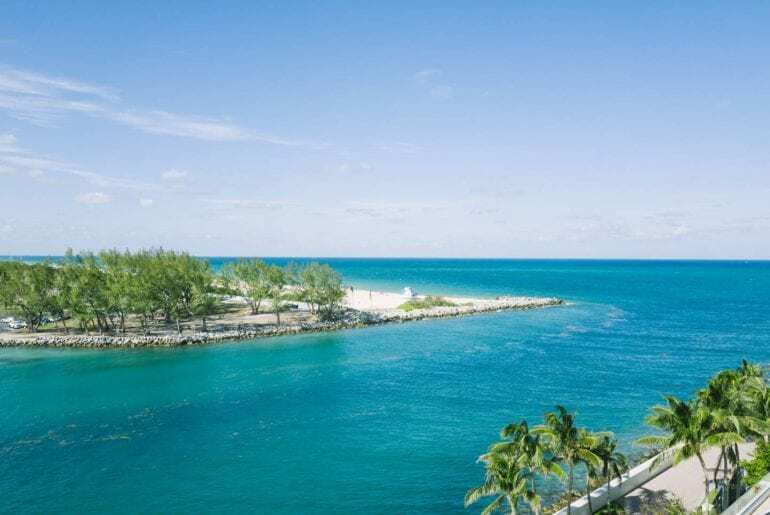 Situated right on Bal Harbour, overlooking Miami Beach, this studio apartment is dripping luxury. 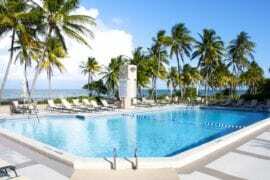 With a huge balcony to enjoy breakfast, as well as all the facilities of the five-star, Miami Modern hotel at your fingertips, this is a fantastic private studio for style-loving honeymooners and those on a romantic break to Miami. Check out the private meditation spaces, as well as the hydrotherapy and spa facilities too! 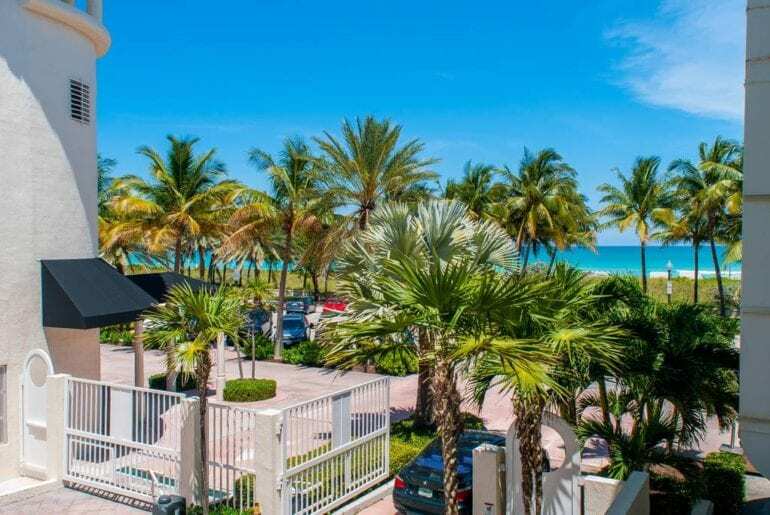 With an outstanding location close to Miami Beach, this is certainly one of the most gorgeous Airbnbs for fans of Miami’s famous MiMo architecture style. 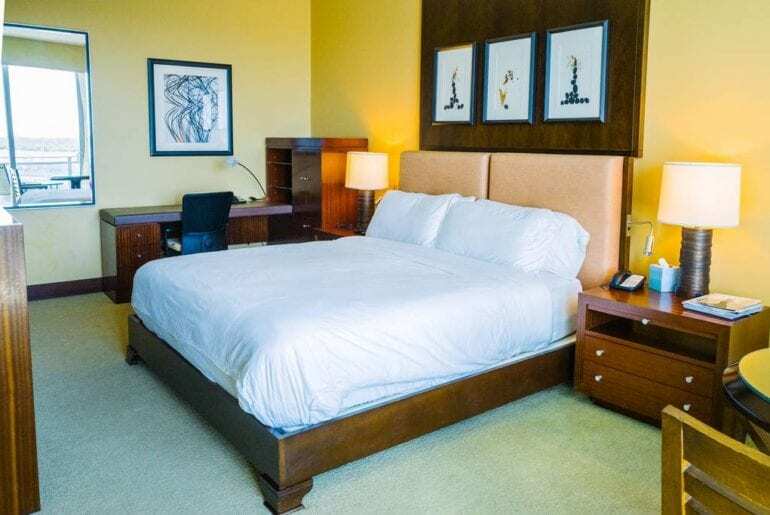 All this luxury starts at just $330 per night. For a different take on classic MiMo style architecture, this massive family home near Biscayne Boulevard does the trick! 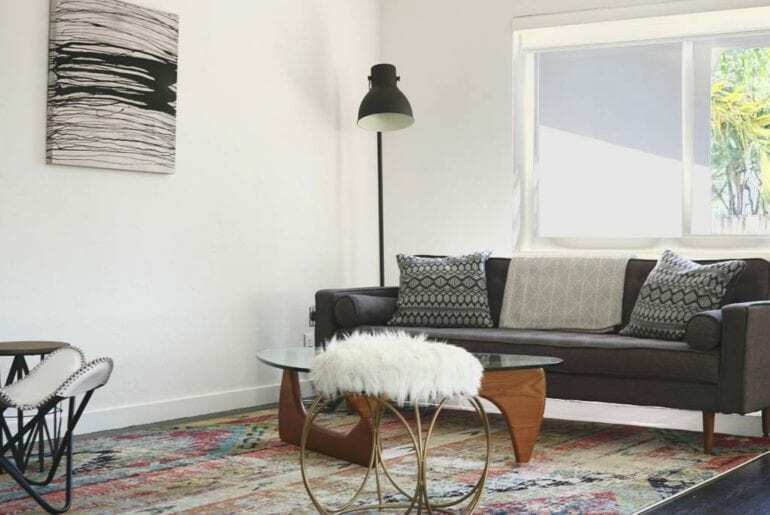 Lovingly restored and transformed into a spacious, stylish family home, this is one of the largest Miami MiMo Airbnbs we’ve found, with enough space for up to 10 guests to sleep comfortably. Recently awarded the #1 Neighbourhood In Miami, this prime location just off of Biscayne Boulevard is home to a number of gorgeous MiMo style homes. This one has four bedrooms, three bathrooms, a private gated entry, and a peaceful backyard with outdoor dining table. 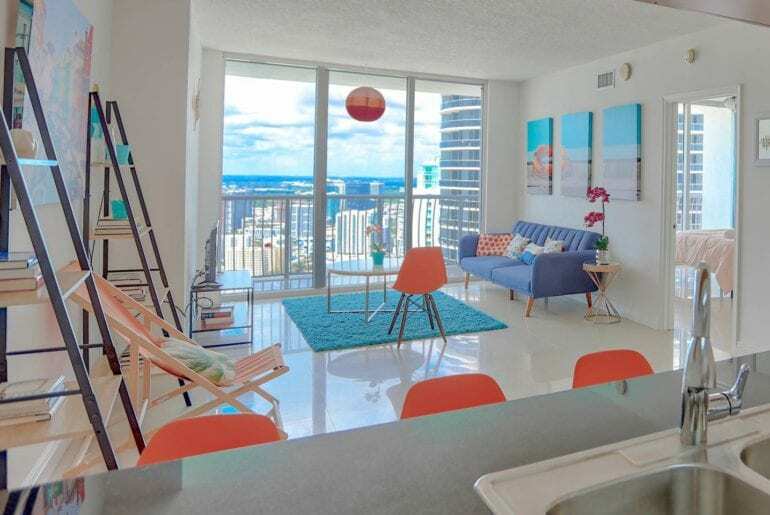 Enjoy being close to the beach and the popular Design District on your next vacation in Miami. Quite simply, it doesn’t get more quintessentially MiMo than this candy-colored charmer. 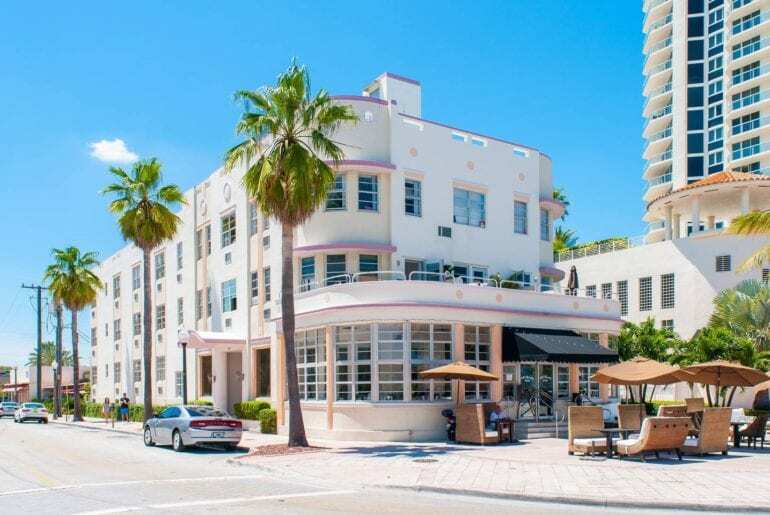 This postcard-perfect, historic building is from the 1930s and located just across the street from the beach! 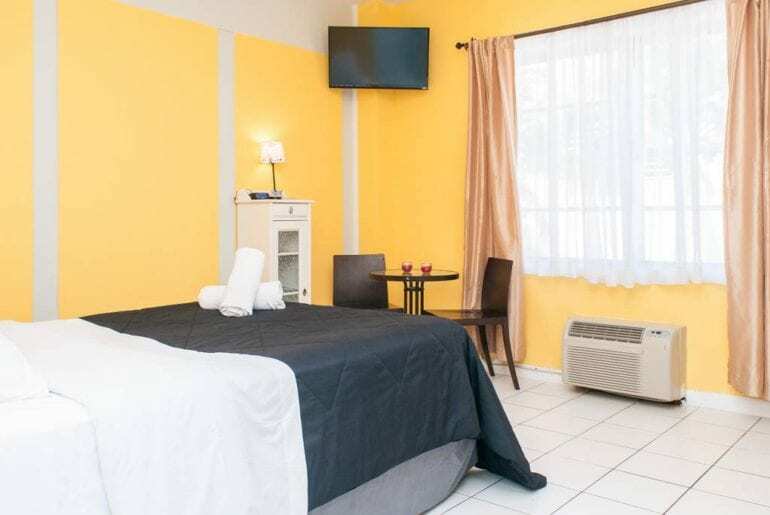 This cozy, cute beachside studio is well-equipped for a single traveler or couple, and a perfect example of amazing Miami MiMo Airbnbs. 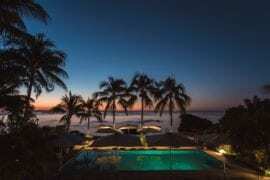 Enjoy vintage tropical vibes and an incredible location, starting at just $99 a night. 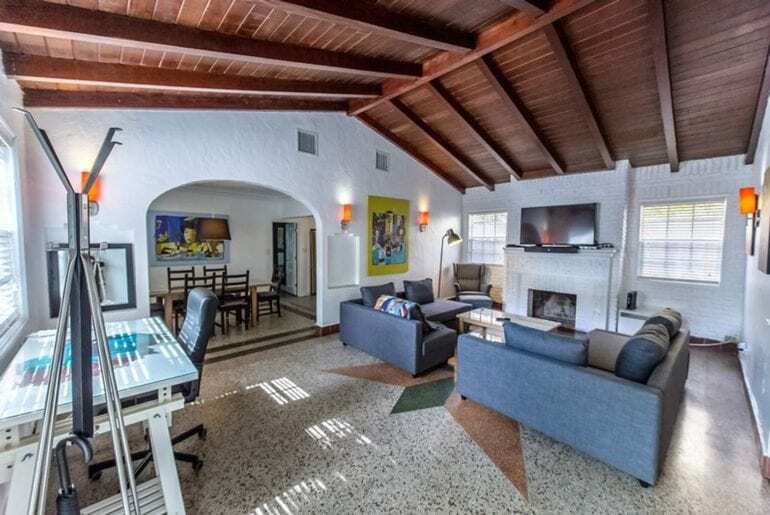 If you’re a fan of Miami Modern architecture, this charming studio is absolutely perfect for you. Walk to the beach and nearby shops, or tuck into a cute little cafe for an iced coffee on a hot summer day. 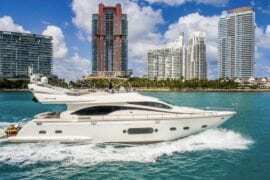 This is the Miami MiMo lifestyle at its finest! 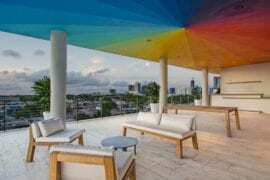 Less than 20 minutes from South Beach, the Bayside neighborhood of Miami’s MiMo district is bursting with cool architecture and great restaurants. 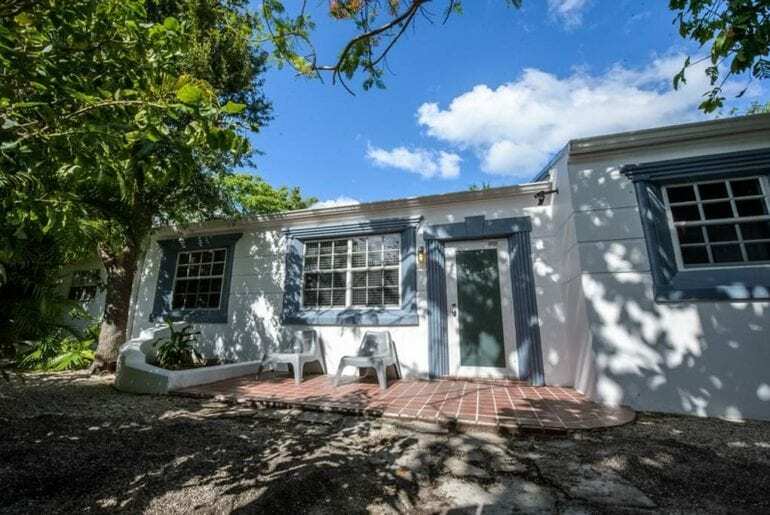 This charming, two-bedroom, two-bathroom Bayside family home is a spacious Miami MiMo Airbnb for up to four guests. 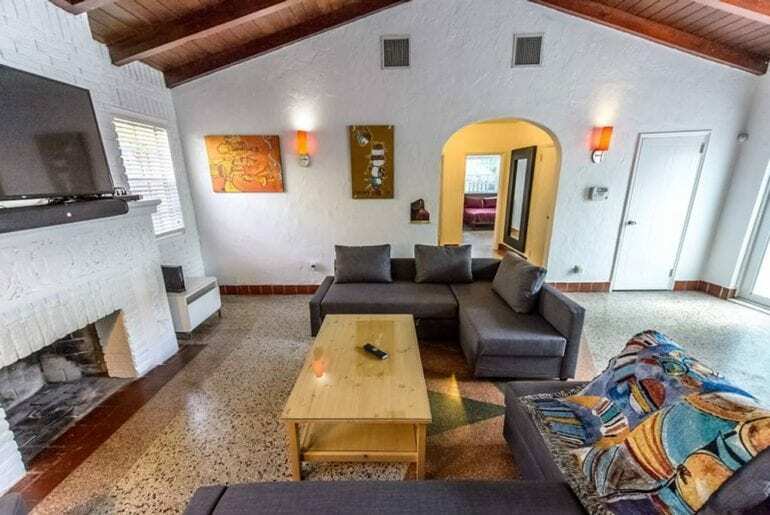 Available from $300 a night, this mid-century MiMo Airbnb has been beautifully remodelled with new fixtures while retaining much of its original historic charm. Enjoy your own private backyard with large swimming pool and deck, the perfect retreat from the steamy Miami heat. 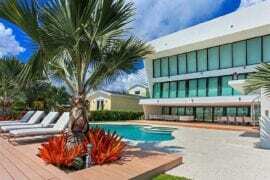 Fans of Miami’s MiMo architecture style will feel right at home here. 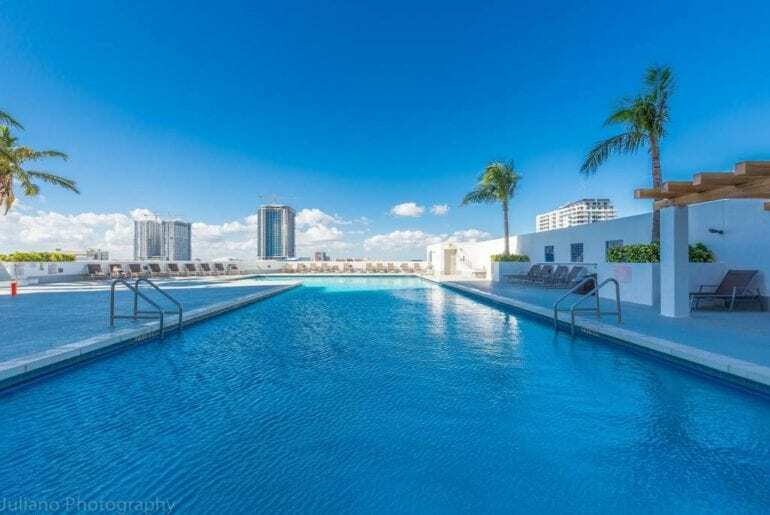 We love when MiMo architecture reaches new heights, like in this gorgeous high-rise luxury condo with resort-style pool. 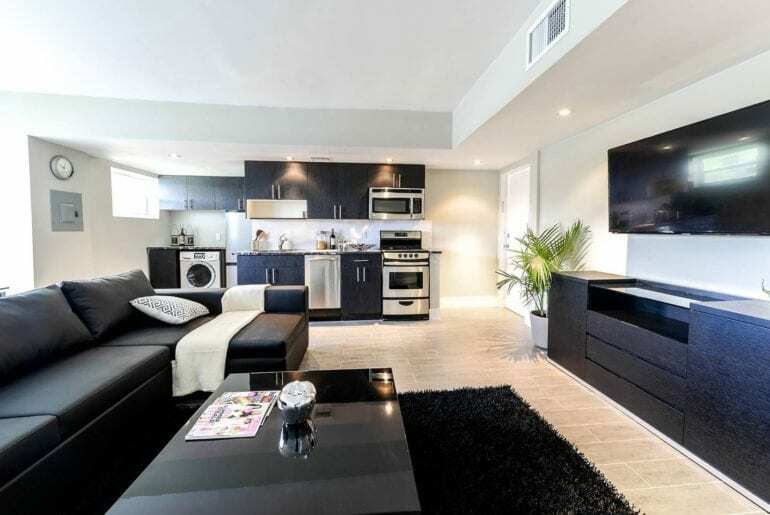 Located in Miami’s posh Sunny Isles neighborhood, this beautiful, modern apartment rental is right in the heart of Miami’s most stylish yacht club and can be yours from just $149 a night. 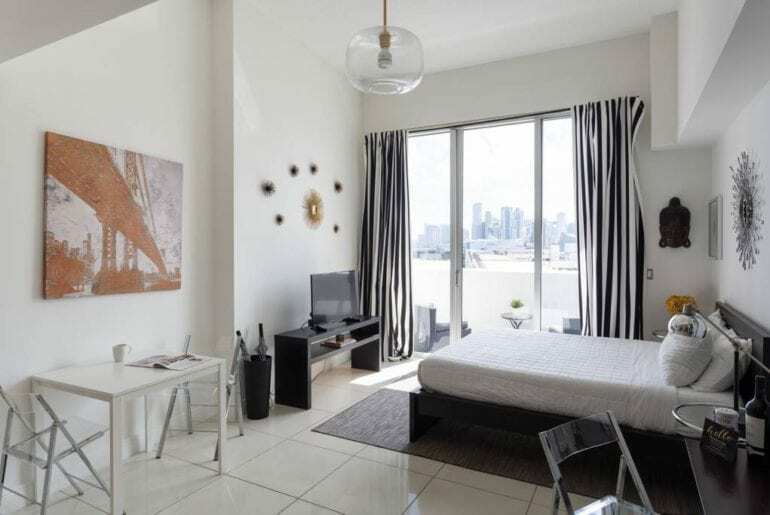 With two bedrooms and three bathrooms, there’s space for up to six guests to stay comfortably in this luxury rental, a great high-rise example of Miami MiMo Airbnbs. Additional amenities include a waterfront, resort-style swimming pool and high-end spa. With so much to love in this gorgeous luxury condo, you might never want to leave!